A front-line report from Sierra Leone examines efforts to change hearts and minds in West Africa’s villages. Nature reporter Erika Check Hayden travels to Sierra Leone to meet the officials fighting the spread of Ebola. Since September, the Ebola virus has stalked the villages and towns along the Kamakwie–Makeni Road, a rutted, red-dirt track that serves as the main artery for a string of villages in the western part of Sierra Leone’s Bombali District. Yeli Sanda, a village just a few kilometres outside the district’s capital city of Makeni, was the first place to be hit. Over the following months, more than 40 people in the settlement of about 700 became infected; 22 died. In November, the virus infected a woman in Tambiama, about 11 km up the road. A friend who visited her acquired the virus and carried it another 1.5 km to the village of Mayata. She and at least five others there have died. But just a few hundred metres from Yeli Sanda, the village of Yoni has not seen a single case of Ebola. As soon as the village chief learned that Ebola had struck, he forbade his citizens from visiting Yeli Sanda or attending burials of its residents. His swift action has kept the 100 people of Yoni healthy while other communities have been devastated. Public-health officials and local leaders who have volunteered in the Ebola fight say that Yoni’s experience is instructive: to banish the virus from the Kamakwie–Makeni Road, which runs for 150 km from Sierra Leone’s fourth-largest city to the Guinean border (see ‘On the road’), they will have to convince people to abandon some long-held beliefs and customs. “If we don’t get cooperation from traditional institutions, we could spend a long time chasing this, village to village, all the way to the border,” says Adam Goguen, the registrar at the University of Makeni and a resident of Yoni. His village looks like any other in the district: a clutch of houses fronting dusty yards, backed by small farming plots cleared out of the scrubby forest. But the exceptional behaviour of its residents — their willingness to cut social ties and abandon cherished traditions — has so far kept it safe. As difficult as it is, public-health officials say, changing behaviour is the key to stopping the Ebola outbreak that has ravaged West Africa for a year. “No more social life. No more business. No more travelling,” says Sorie Bundu Conteh, a disease-surveillance officer. “We need people not to see us as a threat,” he adds. But that is difficult when officials are asking people to restrict their lives so drastically for reasons that can be hard to understand. In Yeli Sanda, communication problems began with the very words that local officials first used to talk about Ebola: there is no word for ‘virus’ in the tongues spoken in the villages along the Kamakwie–Makeni Road. Before the outbreak reached the area, Ebola educators there described the pathogen as a kind of tumbu, or maggot. When Ebola came to Yeli Sanda, a man searched through the blood of someone who had died from it, looking for the maggots. In doing so, he potentially exposed more people to the virus. Yoni chief Pa Alpha Tarawalie understood the situation better than most. He says that he decided to cut his people off from Yeli Sanda on the basis of what he had heard on BBC radio broadcasts, and seen while delivering supplies to quarantined communities on the outskirts of Makeni. With accurate information and a witness’s appreciation of the disease’s devastating effects, he says, he was able to convince his people to sever ties with their closest neighbours. 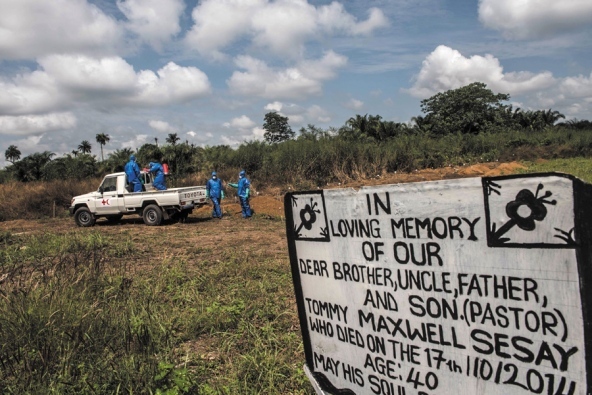 A burial team inters a person who had died in an Ebola holding centre in Makeni, Sierra Leone. The measure angered people in Yeli Sanda, who felt shunned, and even accused the Yoni nurse of witchcraft when she correctly predicted that people who attended Ebola victims’ funerals would contract the disease themselves. But the rift between the two villages has started to heal now that Yeli Sanda’s outbreak has subsided. In November, Yeli Sanda’s chief was suspended for flouting disease-control rules. One of the most effective ways to stop a disease such as Ebola is contact tracing — tracking down and quarantining everyone who may have had close contact with a person who shows symptoms. But when a prominent community member in Yeli Sanda became infected, traditions made contact tracing impossible. The man was a member of Gbangbani, one of several ‘secret’ societies in Sierra Leone that can have an important role in village life. The groups are far from secret in terms of membership — in many villages almost every adult belongs to one. But their proceedings and rituals, including their burial rites, are kept out of public view. When the man died, his fellow members took his body to a remote village and kept to tradition by burying it under cover of darkness. Handling the body of someone who has died of Ebola puts a person at great risk of contracting the disease — normally, anybody who did this would face weeks of quarantine. But nothing about the Gbangbani burial, from the participants to the location, was shared with public-health officials. “We’ve spent years trying to change behaviours, for instance in the HIV epidemic,” says Peter Salama, global emergency coordinator for Ebola with the United Nations charity Unicef. In the case of Ebola, “we’ve got weeks or months”. Some customs, like the burial of the Gbangbani man, are specific to their cultures. Others, such as attending a neighbour’s funeral, are more universal. But they can be just as deadly. The woman who introduced Ebola to Mayata did nothing more unusual than visit an ill friend in a neighbouring town. With her and five other people in Mayata now dead, surviving relatives and neighbours are inclined to run. That has pulled them into conflicts with public-health workers attempting to enforce a quarantine. 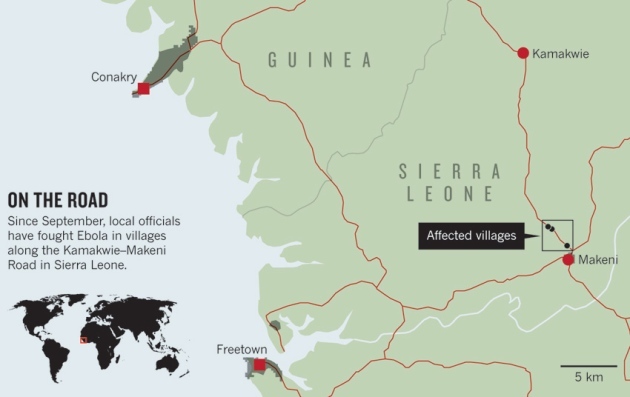 In early December, Father Francis Sehdu Sesay, a dean of theology at the University of Makeni, found village elders in a stand-off with a Mayata woman who was the only survivor out of four adults in her household. She had fled for several days to an unknown location and had just returned to the village. But she refused to go into quarantine back at the house, where four orphaned children remained. As Sesay and the elders pleaded with the woman, she stared straight ahead, her arms folded across her chest. She feared being sent to a distant district for treatment. Sesay explained that she would not be sent away — only watched for symptoms. And if she was diagnosed with Ebola, she could be treated at a local centre that had just opened. The woman relented at last, and agreed to be quarantined in her home. Sesay climbed back into his vehicle and pulled out onto the Kamakwie–Makeni Road. He stared out of the window at the forest that stretches for kilometres in every direction, wondering where in the country’s vast interior the woman had fled to.